Can you believe Thanksgiving is tomorrow? The hubby is off for the next 5 days (yay!!) and we'll be having lots of family time with both of our families so I am super excited about that. It will be so nice to step back from our daily routine to focus on all that we've been so blessed with. Sometimes I forget that and only focus on what I don't have in my life. But I have to remember that the world is much larger than my life. That I am just a small part of it and days that seem unfair or awful to me would be viewed as a blessing for so many less fortunate people in the world. I just want to thank you all for following this blog and joining me on my daily ventures in home, fashion, and mommy-hood. Having you all as readers makes writing this blog that much more rewarding for me. I will be taking a short break from the blog until Friday, but follow me on Instagram to see all the family fun (and shopping) I'll be up to during this Thanksgiving break. I hope you all have a wonderful and safe Thanksgiving holiday! Love this… "But I have to remember that the world is much larger than my life. That I am just a small part of it and days that seem unfair or awful to me would be viewed as a blessing for so many less fortunate people in the world." 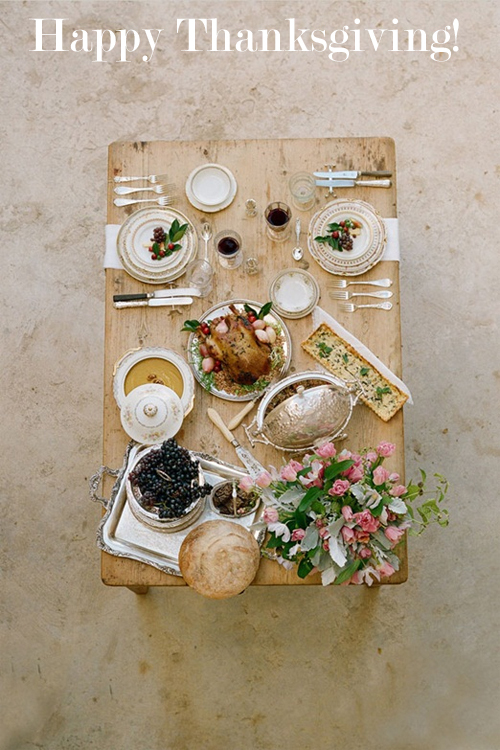 Hope you and your family have a beautiful Thanksgiving!